The best and most fun way of learning is by playing games! This winter, Derzelis made seven playful galactic snowmen for all the kids who are inquisitive and smart. At first, she had taught the galactic snowmen how to play hide-and-seek. As soon as she realized that the game was a piece of cake to the children on Earth, she changed the rules a bit to increase the challenge. Find out what she came up with by entering the Dacobots.com elearning portal! Derzelis thinks that digit recognition is a must when it comes to the abilities of preschoolers. She created an interactive elearning game to teach children the order of the digits from 1 to 7. 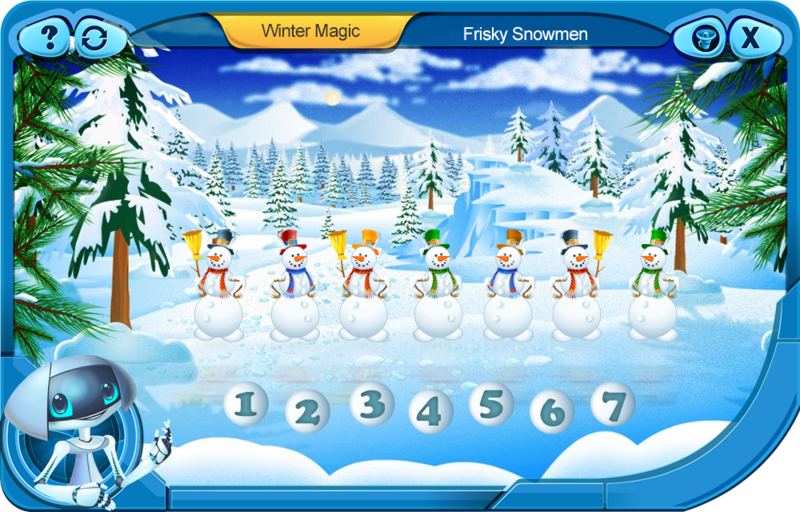 This is how the game works – first, three snowmen appear on the screen. Derzelis tells the players to close their eyes. In the meantime, one of the frisky snowmen hides away. Derzelis tells the players to reopen their eyes and press on the digit located below the missing snowmen. When kids press on the right digit, Derzelis utters the corresponding ordinal numeral. This activity is ideal for increasing both the mathematical and the linguistic abilities of youngsters all over planet Earth! However, this is only the first level of the game. During the second level, the number of snowmen increases to seven. Moreover, not only one, but two snowmen hide away this time. Are you equal to this challenge? Don’t worry, as Derzelis will guide you and provide instruction throughout the entire activity. Enter the Dacobots.com educational portal, sign up, and start playing the elearning games for kids! You can find this game right here - Frisky Snowmen.